Psalm 151 is the name given to a short psalm that is found in most copies of the Septuagint but not in the Masoretic Text of the Hebrew Bible. The title given to this psalm in the Septuagint indicates that it is supernumerary, and no number is affixed to it: "This Psalm is ascribed to David and is outside the number. When he slew Goliath in single combat". It is also included in some manuscripts of the Peshitta. The Eastern Orthodox Church as well as the Coptic Orthodox Church, Armenian Apostolic Church and the Armenian Catholic Church accept Psalm 151 as canonical. Roman Catholics, Protestants, and most Jews consider it apocryphal. However, it is found in an appendix in some Catholic Bibles, such as certain editions of the Latin Vulgate, as well as in some ecumenical translations, such as the New Revised Standard Version. 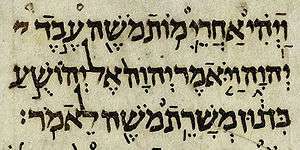 Although for many years scholars believed that Psalm 151 might have been an original Greek composition and that “there is no evidence that Psalm 151 ever existed in Hebrew”, we now know from the Dead Sea scrolls that this psalm did in fact exist in Hebrew and was a part of the psalter used by the Qumran community. Psalm 151 appears along with a number of canonical and non-canonical psalms in the Dead Sea scroll 11QPs(a) (named also 11Q5), a first-century AD scroll discovered in 1956. The editio princeps of this manuscript was first published in 1963 by J. A. Sanders. This scroll contains two short Hebrew psalms which scholars now agree served as the basis for Psalm 151. One of these Hebrew psalms, known as “Psalm 151a”, is reflected in verses 1–5 of the Greek Psalm 151, while verses 6 onward are derived from the other Hebrew psalm, known as “Psalm 151b” (which is only partially preserved). The composer has brought the two Hebrew psalms together in a manner that significantly changes their meaning and structure, but the influence of the Hebrew originals is still readily apparent. In some ways the Greek version of Psalm 151 does not seem to make good sense, and the Hebrew text provides a basis for a better understanding of what transpired in the creation of the Greek version. In comparison to the Hebrew text Sanders regards the Greek text of this psalm to be in places “desiccated”, “meaningless”, “truncated”, “ridiculous”, “absurd”, “jumbled”, and “disappointingly different”, all this the result of its having been “made from a truncated amalgamation of the two Hebrew psalms”. On details of translation, structure, and meaning of this psalm see especially the works of Skehan, Brownlee, Carmignac, Strugnell, Rabinowitz, Dupont-Sommer, and Flint. The title of the psalm states that it was written by David after his battle with Goliath. As it stands in the Greek text in this psalm, David rejoices that God favors him and hears his prayers and worship. David states that he was the least of his brothers, and yet God chose him to be anointed king (vv. 1–5). It goes on to commemorate how David cut off Goliath's head with the Philistine's own sword, and thereby removed Israel's disgrace (vv. 6–7). The psalm assumes familiarity with and draws ideas and phraseology from elsewhere in the Bible. Besides being available in orthodox or ecumenical editions of modern translations since 1977 (Revised Standard Version, New Revised Standard Version, English Standard Version, Orthodox Study Bible, Contemporary English Version, Common English Bible), there are a number of English Translations now in the public domain. William Whiston included it in his Authentic Records. It can be found in the LXX translations of Charles Thomson and Lancelot Charles Lee Brenton, and Adam Clarke's commentary. It is included in Sabine Baring-Gould's Legends of the Patriarchs and Prophets, William Digby Seymour's Hebrew Psalter, and William Ralph Churton's Uncanonical and Apocryphal Scriptures. William Wright (orientalist) published a translation of the Syriac in the Proceedings of the Society of Biblical Archaeology, June 1887, and A. A. Brockman published a translation from the Coptic in the January 27, 1898 New York Times. At the beginning of his first address to his Council of State, Emperor Haile Selassie of Ethiopia recited this psalm in total. The TV show "Touched by an Angel, Season 5, Episode 9 (originally aired 15 November 1998) is titled "Psalm 151" with a song sung by Wynonna Judd called 'Testify to Love'. In the episode she composes the song for her dying son. In 1993, Péter Eötvös composed "Psalm 151 – In Memoriam Frank Zappa" for solo or four percussionists. ↑ Swete 1914, p. 252. ↑ "151", Athanasian Grail Psalter . ↑ Swete 1914, p. 253. ↑ Sanders, JA (1963), "Ps. 151 in 11QPss", ZAW, 75: 73–86, doi:10.1515/zatw.1963.75.1.73 , and slightly revised in Sanders, JA (ed. 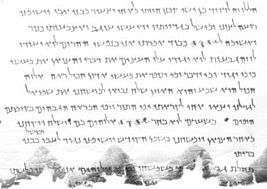 ), "The Psalms Scroll of Qumrân Cave 11 (11QPsa)", DJD, 4: 54–64 . ↑ Abegg, Martin Jr; Flint, Peter; Ulrich, Eugene (1999), The Dead Sea Scrolls Bible, HarperCollins, pp. 585–86, ISBN 0-06-060064-0 . ↑ Sanders, JA, The Dead Sea Psalms Scroll, pp. 94–100 . ↑ Skehan, PW (1963), "The Apocryphal Psalm 151", CBQ, 25: 407–9 . ↑ Brownlee, WH (1963), "The 11Q Counterpart to Ps 151,1–5", RevQ, 4: 379–87 . ↑ Carmignac, J (1963), "La forme poétique du Psaume 151 de la grotte 11", RevQ (in French), 4: 371–78 . ↑ Carmignac, J (1965), "Précisions sur la forme poétique du Psaume 151", RevQ (in French), 5: 249–52 . ↑ Strugnell, John (1966), "Notes on the Text and Transmission of the Apocryphal Psalms 151, 154 (= Syr. II) and 155 (= Syr. III)", Harvard Theological Review, 59: 257–81 . ↑ Rabinowitz, I (1964), "The Alleged Orphism of 11QPss 28 3–12", ZAW, 76: 193–200 . ↑ Dupont-Sommer, A (1964), "Le Psaume CLI dans 11QPsa et le problème de son origine essénienne", Semitica, 14: 25–62 . ↑ Verse 3: "Who will announce this to my Lord? My Lord Himself, for he is listening"
↑ Marcus, Harold (1996), Haile Selassie I: The Formative Years, Lawrenceville: Red Sea Press, p. 96 . ↑ Eötvös, Peter. "Composer, Conductor, Professor". Compositions. Peter Eötvös. Retrieved 28 December 2012.